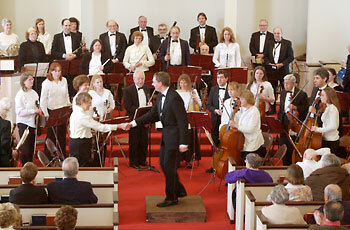 Here is a group photo of the November 3 concert sponsors, from P.E. 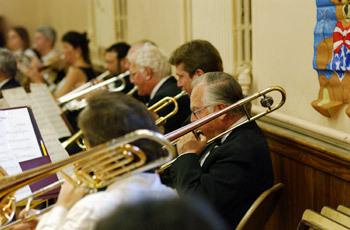 Murray-George F. Doherty & Sons Funeral Home, with some of the Orchestra’s West Roxbury orchestra members. 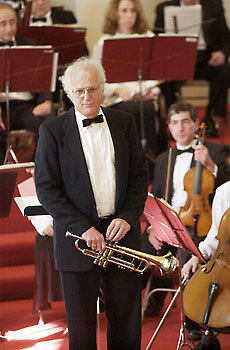 Thanks to Susan Silverman for this photo. 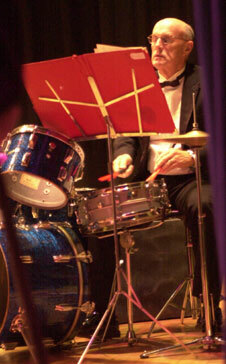 Tom Finn made a “hit” on the percussion solo to Leroy Anderson’s Sandpaper Ballet. 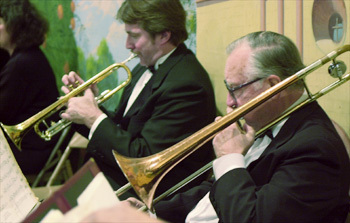 Board Member and trumpet player Howard Ostroff expressed the Orchestra’s appreciation to Ryan for his leadership and effort. 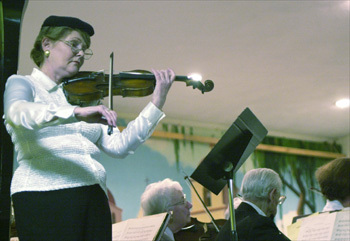 Following enthusiastic applause and demands for an encore, Ryan Hudson bows at the conclusion of a wonderful season premier performance. 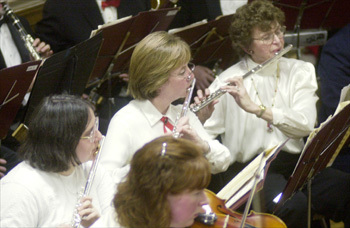 The December 15th program is sponsored by Folsom Funeral Service. 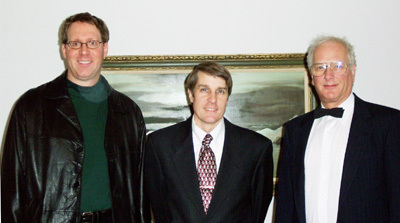 Shown in this photo are (left to right) Lawrence Isaacson, PCO Music Director, Mr. Robert Folsom of Folsom Funeral Services and Howard Ostroff, Concert Chairman. 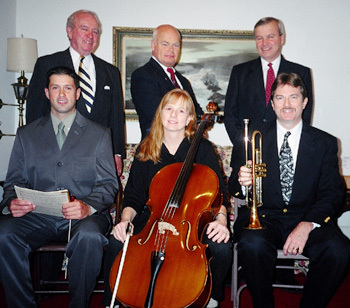 Family owned and operated since 1905, Folsom Funeral Service is a long–term sponsor of Parkway Concert Orchestra concerts and has been supporting the arts in the community since 1905. 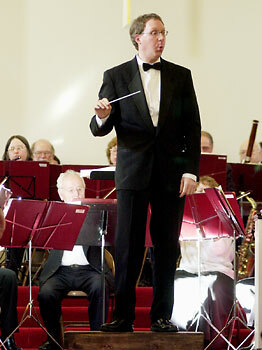 Thanks to Helen Tarantino for the photograph! 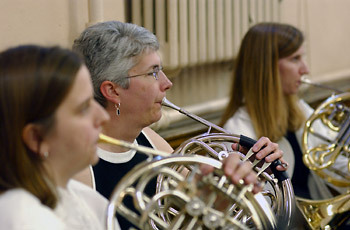 Following are some glimpses of the various sections hard at work. 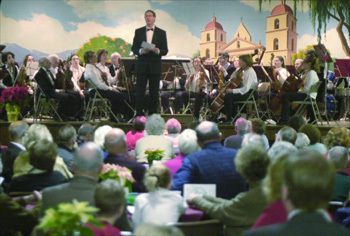 The audience was large and appreciative of Music Director Lawrence Isaacson’s informative and entertaining remarks throughout. 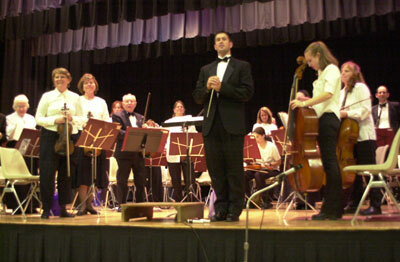 After a moving encore of “Let There Be Peace on Earth”, the Orchestra took a final bow. 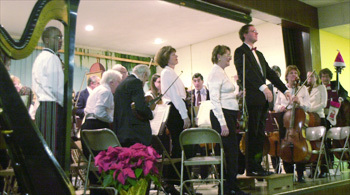 The second Holiday Concert was presented at the Dedham Masonic Hall on December 15, and was noteworthy because it was organized, sponsored and presented by the Parkway Concert Orchestra itself. 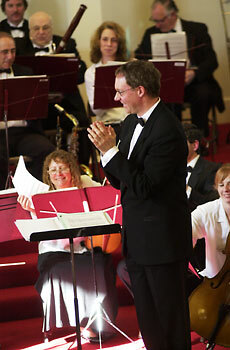 The audience turn out was fantastic - better than anyone could have anticipated! 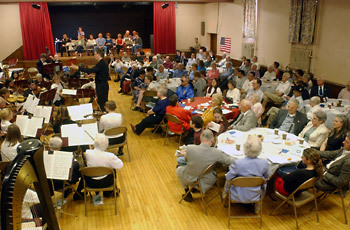 Every chair and bench in the Masonic Hall was pressed into service. 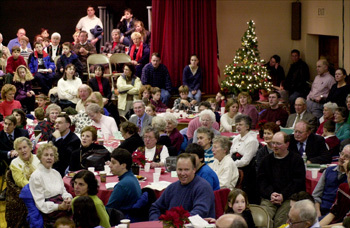 The festive holiday atmosphere coupled with an enthusiastic, capacity crowd generated some extraordinary excitement. 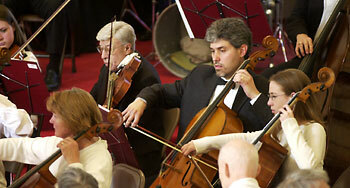 Orchestra Music Director Lawrence Isaacson channeled the musicians’s energy into an exceptional performance. 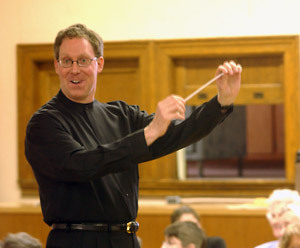 and even presented maestro Isaacson with a candy striped baton! 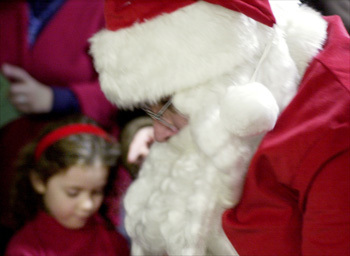 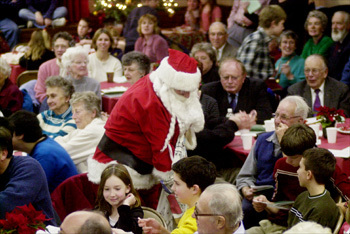 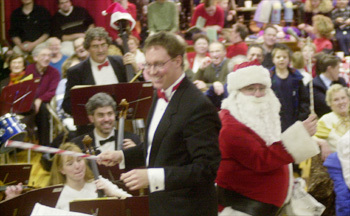 Santa and Mr. Isaacson then proceeded to conduct in tandem a sing–along version of “A White Chistmas”. 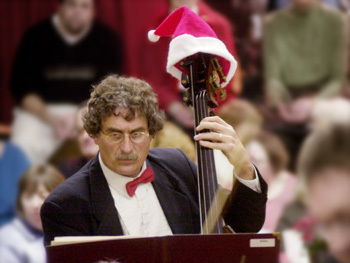 Santa overlooked no one, and neither did the Orchestra, which managed once again to provide a marvelous afternoon of entertainment that appealed to a broad range of musical tastes and at the same time spanned generations. 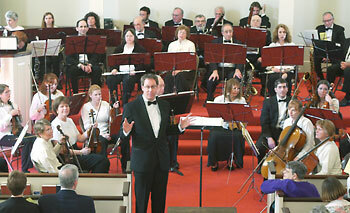 The Orchestra gave a tremendous performance on Sunday, April 6. 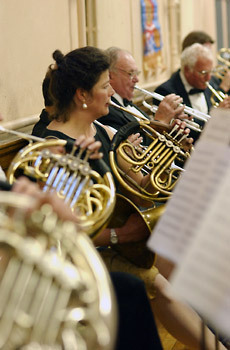 It seems every concert allows me to get a different perspective on the orchestra. 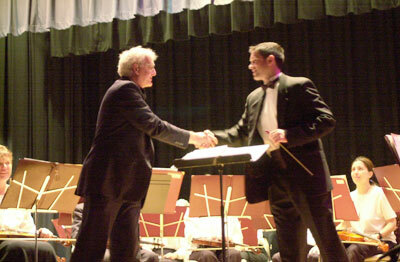 Here we have Howard Ostroff making opening remarks and Conductor Lawrence Isaacson opening the concert by shaking hands with Concert Master Kelley. 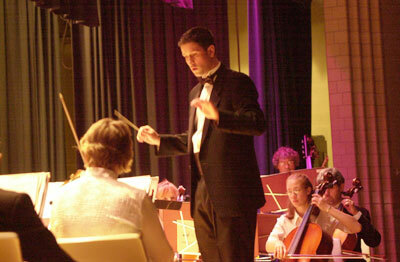 This concert’s special guest was the Westwood High School Concert Band. 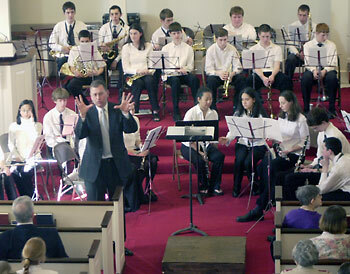 Here we have conductor James Giurleo introducing the Concert Band, and a glimpse of some of the student musicians. 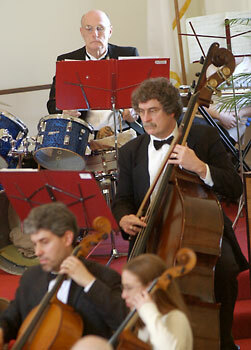 As I said, each venue offers me a different vantage point. 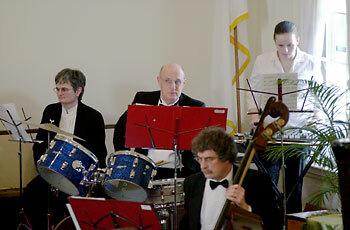 The Islington Church balcony gave me an opportunity to get some glimpses of sections that I don’t always have a clear view of. 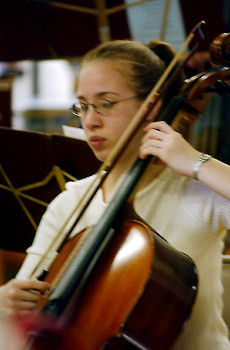 What studies of concentration! 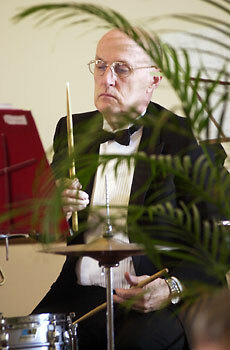 Tom Finn, nearly concealed in the ferns, brings the “Syncopated Clock” to life! 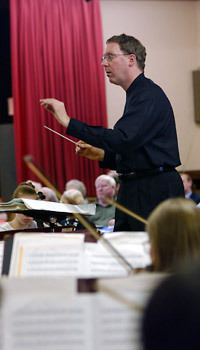 Lawrence Isaacson giving an introduction to a piece, and a final bow. 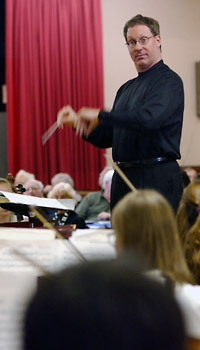 And, in what might be a PCO first: Conductor Isaacson turns his back to the orchestra and conducts the audience whistling to the delightful encore, “Colonel Bogey”! 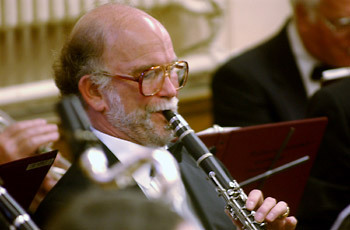 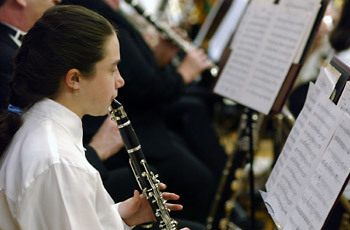 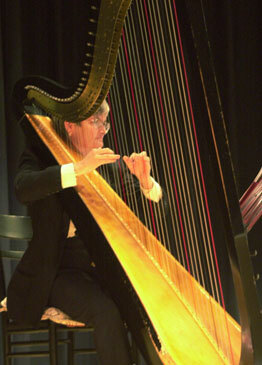 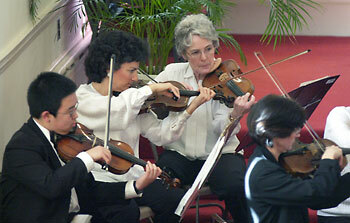 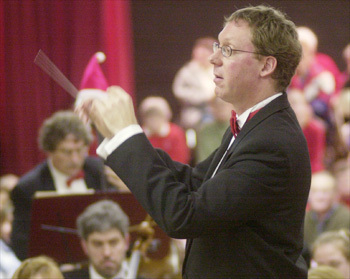 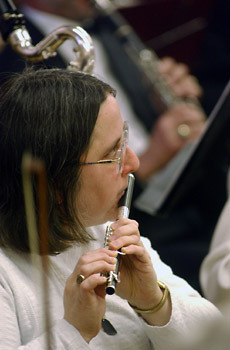 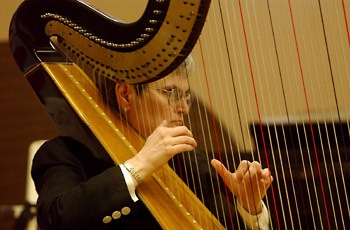 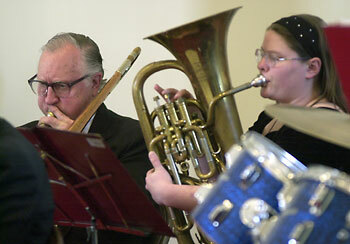 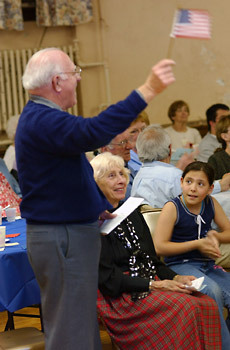 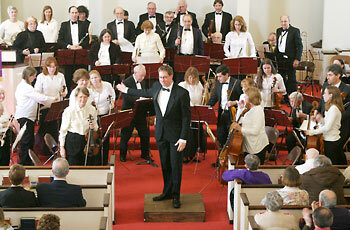 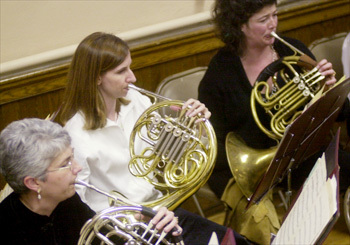 The Orchestra concluded its 2002-2003 performance season on May 18 at the Dedham Masonic Hall. 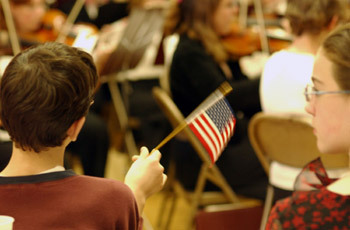 In recognition of Armed Forces Day, a strong theme of patriotism surrounded the choice of both music and decoration in the Hall! 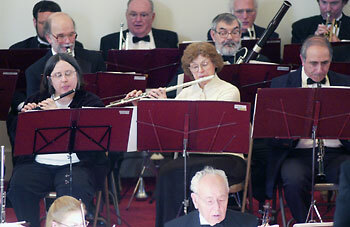 It was a truly magnificent spring afternoon, but in spite of the glorious weather the concert managed to draw a dedicated and enthusiastic audience. 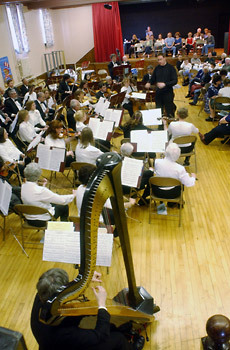 Having definitely outgrown the Masonic Hall’s stage, the orchestra shared the floor with the audience. 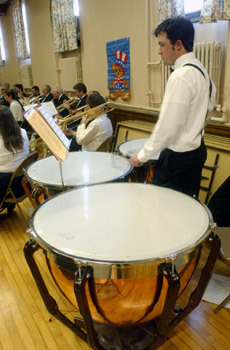 As you can see, there were no bad seats in the house! 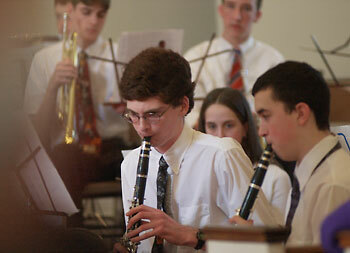 The first half of the concert was predominately classical; after intermission is was popular music and show tunes. 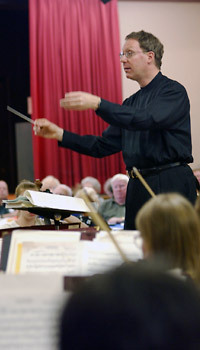 Following are some studies in concentration and artistry — “faces in the orchestra” — starting with the very capable and expressive conductor, Lawrence Isaacson. 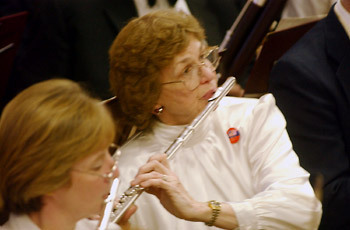 Vicki Nelson and Muriel Porter; Muriel played the solo flute in the haunting “Pavanne”, by Gabriel Faure. 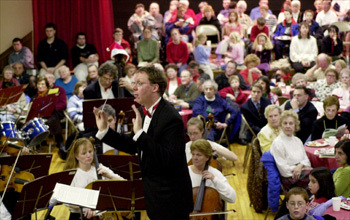 The theme of the concert was “Honoring the Troops Serving Our Country”, and a festive, patriotic atmosphere was evident in every corner of the audience! 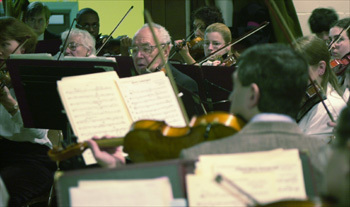 Near the end of the concert the orchestra played a medley of anthems for each branch of the Armed Forces. 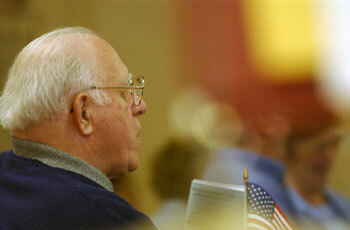 Mr. Isaacson asked any Veteran in the audience to stand as their anthem was played. 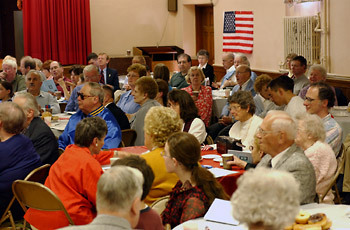 It was a powerful and moving experience as one by one a significant portion of the audience stood to be recognized for their service to our country. 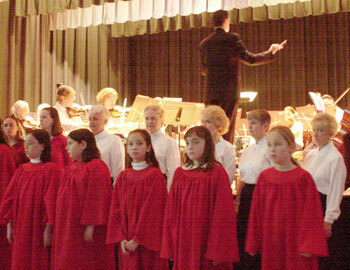 The concert (and the season) concluded with a rousing encore of “Colonel Bogey”. 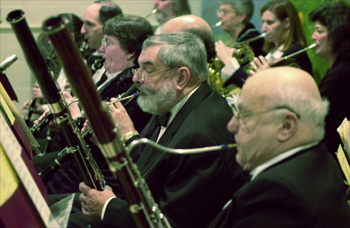 The audience was invited to support the Orchestra by whistling their part and it’s clear they participated with enthusiasm!